There are no differences in the game between these 2 versions, but the inlay was different. Oric-1 inlay had the Oric's white and blue colors and a separated manual, while the Oric-1/Atmos version had both white/blue and black/red colors, and the manual was printed on the inlay. There was nothing on inlay_b, for both versions. The Oric-1 version had a tape with 2 fast recordings on side A, and a slow recording on side B, and was labelled "Oric". Some tapes were black and some other were white. It seems there are even several different white tapes. The Oric-1/Atmos version only had one fast recording on both sides, and was labelled "Atmos / Oric 1". No idea if there were several tapes colors. [harrier_tape_o3.jpg] (from the Internet) = Oric-1 another white tape, side a. Along with Xenon-1, The Ultra, Zorgons etc, this MUST be in every Oric owners TOP FIVE games of all time. Agree with Lothlin that the graphics are smoother in Scuba Dive, nevertheless, this game has a great, realistic narrative - bomb those invading Argies! 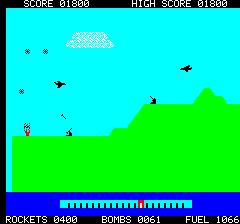 Hate to admit it but the CBM64 version was pure class - you could swivel the Harrier around in mid-air, like the real thing, then instantly zip off in the opposite direction. Still, all credit to the programmer and Durrell - great job, fellas. Marvellous memories. 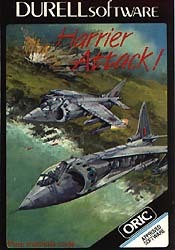 A very good game I played a lot in the eighties. Trying to found the right speed to shoot and bomb as many enemies as possible and still be able to land the harrier before running out of fuel. This was one of the first games I played on the Oric-1, it was sort of the only cool 'arcade' title available during the Oric-1 launch in Australia .. got quite fed up with it often and quickly but nevertheless played it so much that its sort of burned in my retina ..
A pure classic. Unfortunately I do remember playing it on the Spectrum first. Key response is ok, but sometimes difficult to move and fire at the same time. Overall a pretty good game. Perfect example of a simple and efficient game. 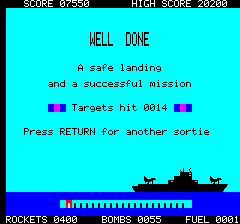 Fast and funny, it's very pleasant to see finally the buildings in the end and drop all the remaining bombs on them. 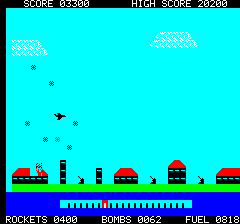 It's a very good shoot-them-up, and I recall playing it using Joytick Adapter 1 program: it required 2 joystick (the 2nd one was just for bombing, or shooting maybe). There were 2 versions of this program: an early release Oric-1 only, and a later release which was Atmos-compatible. Don't be afraid because of the simplicity of graphics, because actually that game is quite brilliant. Like most Durel Software games that one is in text mode using redefined characters, but that also means that the action is fast and smooth. Here you have to take off, bomb buildings, avoid DCA shoots, avoir beeing shoot by ennemi fighters, and finaly get back to the aircraft for landing. Quite addictive.